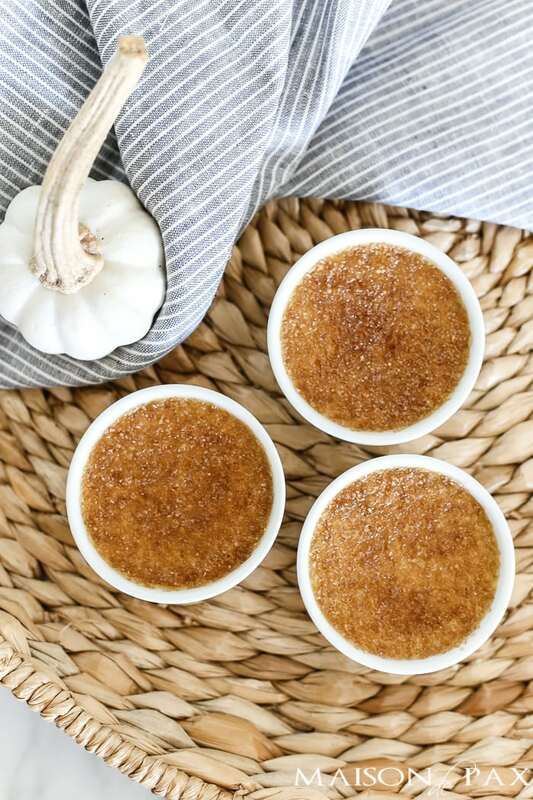 Pumpkin creme brulee: a fall twist on a favorite traditional dessert. 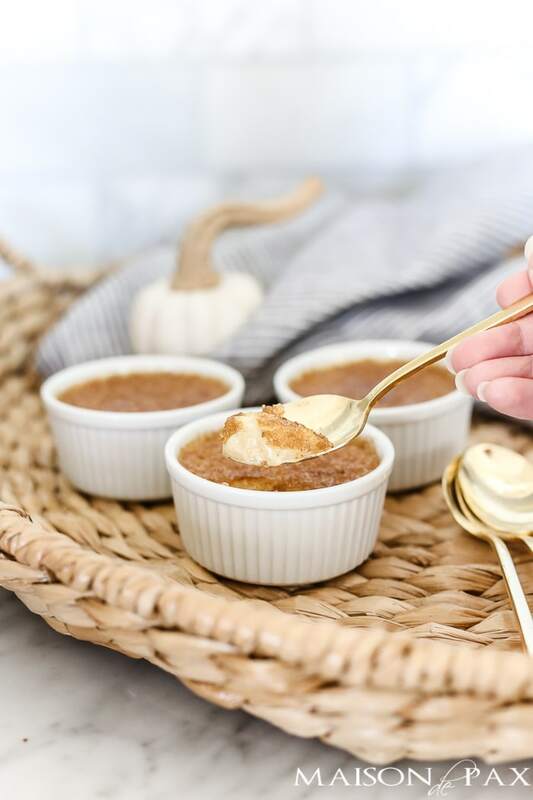 Get the recipe for this rich creamy pumpkin custard topped with a crisp sugar shell. Honestly, this was my first time to actually make creme brulee, and not only was it super easy, it was so good I couldn’t even resist eating the one I was staging to photograph. My three year old daughter was able to help me make it, and since it has to be chilled, it’s the perfect thing to make ahead for company. And I always thought you needed a torch to get that perfect sugared crust on creme brulee, but it turns out a hot broiler accomplishes it perfectly. Heat cream, milk, and spices in a medium saucepan over medium heat, stirring occasionally. Bring just to a boil and then remove from heat immediately. Allow to sit 15 minutes for flavors to mix. After 15 minutes, whisk the 1/2 cup sugar into the egg yolks in a large bowl. Continue whisking as you pour the hot cream mixture into the sugared egg yolks. 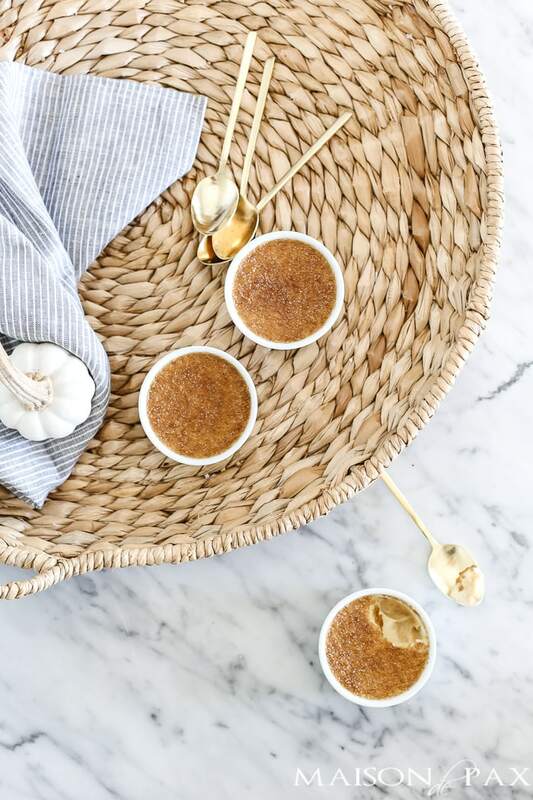 Pour the mixture into oven-safe ramekins (it fits perfectly into 6 4-ounce ramekins) and arrange in a hot water bath (for a hot water bath, use a baking pan with a lip and pour hot water into the pan approximately half way up your ramekins). Bake at 300 for 30-40 minutes. The center of the custard should still shake a bit when you remove it from the oven; it will firm up as it cools. Remove from the water bath and let cool 15 minutes, then cover each ramekin tightly with plastic wrap (careful not to let it touch the custard) and refrigerate to cool completely. Just before serving, preheat your broiler on high and top each custard with a thin layer of raw sugar (pour off the excess). 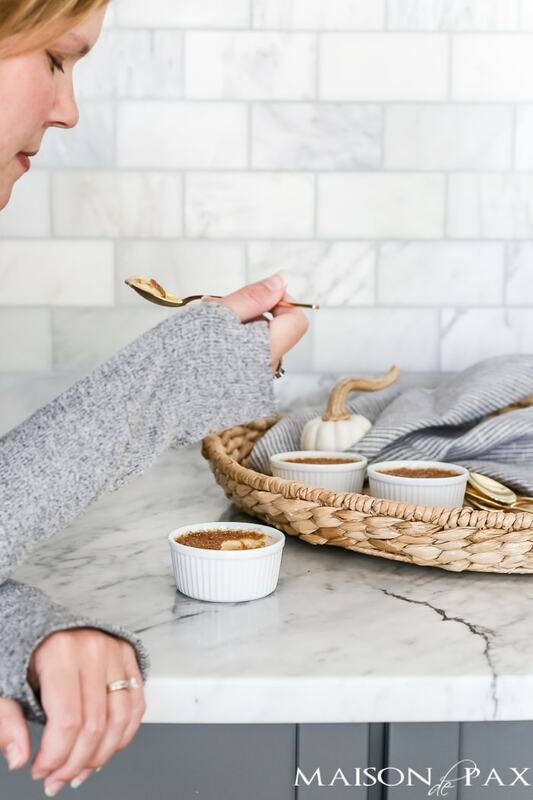 Put your ramekins on a baking sheet and broil until the sugar is melted and browned (generally just 1-2 minutes… so watch carefully!). Let cool 1 minute and serve! I’m telling you, this just might be my favorite new fall recipe… I can’t wait to hear if you love it as much as I do. Pin it for later! And if you’re as much of a pumpkin fanatic as I am, you’ll love what I have for you today: 17 other autumn pumpkin recipes! Which ones do you find tempting?? Creme Brûlée is one of my favorites! I love this seasonal twist. What a great idea! Thanks Michael. It’s one of my favorites too. This sounds lovely but how many servings/ramekins does this recipe make? 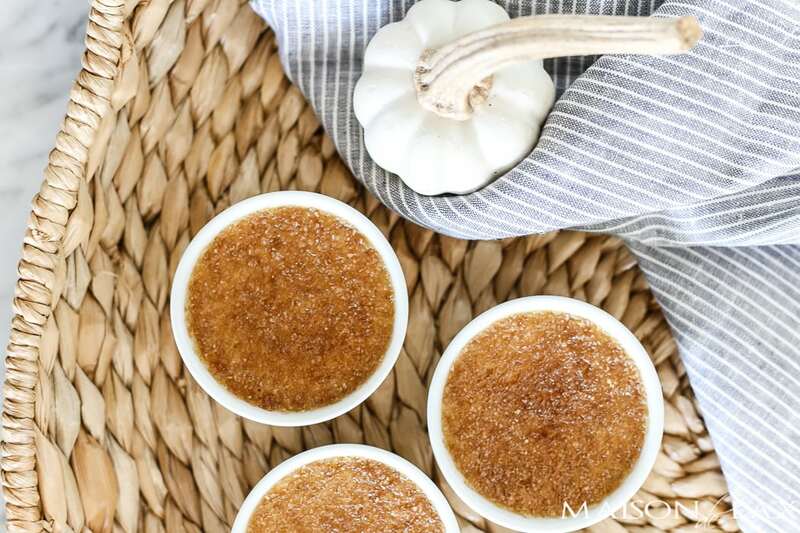 This creme brulee looks so creamy and full of pumpkin goodness! 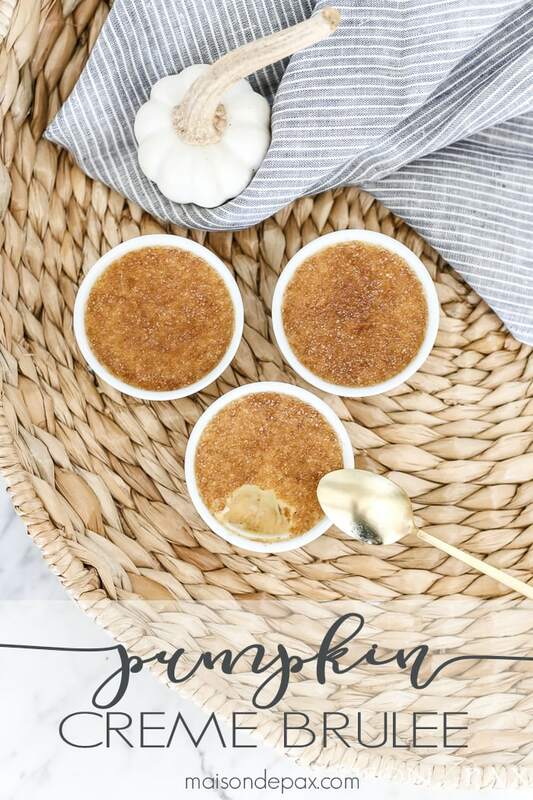 Such a perfect dessert for fall. Thank you! The perfect French treat! one of my favorite fall desserts!!!! YUM! !